1492: a decisive date in the history of humanity. For some, it was a tremendous discovery; for others, it was a catastrophe. It constitutes a clear demarcation in history, because the discovery of America would call into question a great deal of knowledge about the Earth. Furthermore, that is why historians chose this date to define the beginning of a new historical period: the modern era. The success of the expedition led by Christopher Columbus, who, at least officially, was the first European to set foot on the soil of America, has all too often made us forget the multiple expeditions during the Middle Ages, over land or by sea, as well as the discoveries of the explorers. In particular, there was the fabulous odyssey of Marco Polo, the Venetian merchant who followed the silk road to China, the mystical voyage of Saint Brendan and the Norse or Viking settlement in Newfoundland. The voyage of Columbus would encourage Europeans to seek a passage to the East in order to exploit the riches attributed to this region. However, at the dawn of the Renaissance, many unfounded beliefs still held currency. In fact, although since Antiquity it was known that the Earth was round, the Catholic Church and a number of scientists continued to assert that the planet was flat and rectangular. Gaps remained in geographical knowledge. Certain explorers still believed in the existence of mythical countries, such as the kingdom of Prester John thought to be located in Ethiopia, or that of King Solomon, which concealed, according to legend, countless riches. In the ninth century, what we now know as the nation of France was part of the Carolingian Empire, a vast realm covering much of western and central Europe. When the Empire was divided by treaty in 843, three kingdoms were created and it is from the western kingdom, West Francia, that France—eventually—evolved. From 987 onwards this kingdom was ruled by the Capetian dynasty. Though a kingdom by name, West Francia was politically and territorially fragmented. Regions such as Flanders, Burgundy, Normandy and Aquitaine had their own princes and operated as virtually independent principalities. French society was structured along feudal lines: through oaths of loyalty men became vassals of lords who, in exchange for certain dues (including financial and military assistance) offered protection and property, or the use of land. In theory the king was at the apex of the pyramid of feudal power but in practice he was easily eclipsed by any regional lord busy accumulating his own “army” of vassals who were loyal to himself rather than to the king. There was no sense of nationhood; loyalties were local rather than national. Hugh Capet, who was elected king in 987, was just one of many powerful nobles in the realm and the territories under his direct control were not particularly substantial. 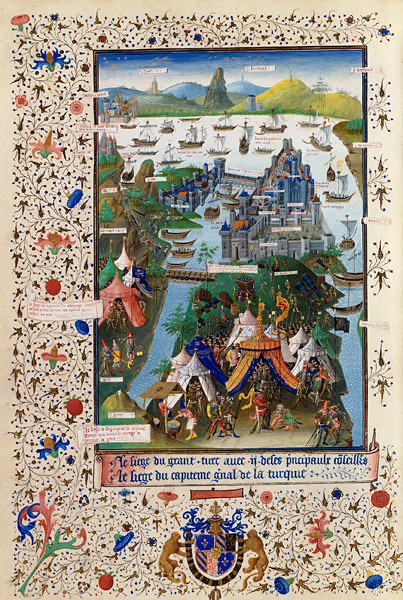 They were, however, strategically significant, encompassing the important cities of Paris and Orléans as well as some particularly fertile land intersected by waterways and roads. Something else set Capet apart: he alone had been anointed with holy oil during a coronation ceremony that emphasized the connection between kingship and priesthood. As consecrated king, Capet was God’s Anointed and this was something the French people took very seriously (successive Capetian kings were believed to have miraculous healing powers). This sense of spiritual prestige associated with the monarchy is something that later kings would exploit to the full. 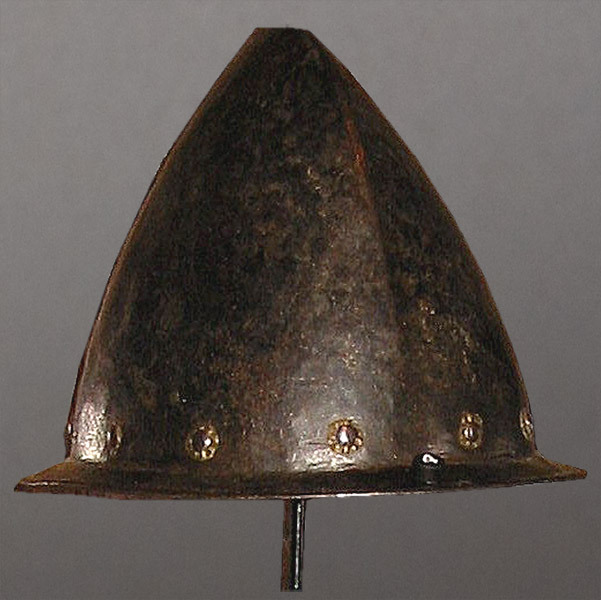 Between the eleventh and early fourteenth centuries Capetian Kings worked hard at consolidating royal power and authority through a combination of administrative, financial, judicial, and military reforms and strategies. A centralized, bureaucratic system of government began, slowly, to replace the feudal order. Philip Augustus (1180­–1223), for example, created a new class of royal officials known as baillis who were sent into the provinces charged with administering justice, representing the king, and relaying his orders. 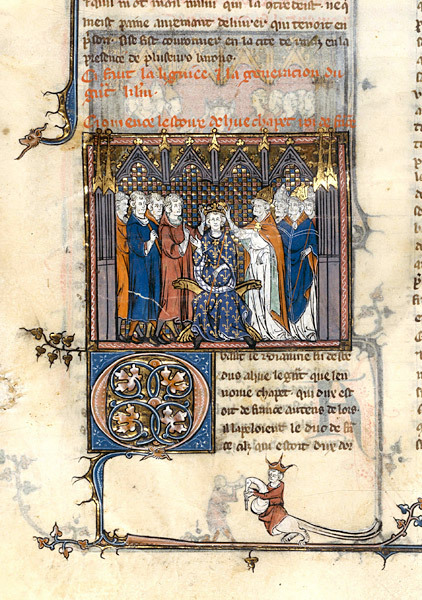 Louis IX (1226–70) established a parlement that would become the supreme court of appeal (over and above seigneurial or ecclesiastical courts); he also instituted a chamber of accounts (an early treasury) and introduced a royal coinage. The monarchy gained territory, prestige, and tax revenues through its battles against the English and its participation in the Crusades. During this period, France, like much of Europe, also benefited from social, demographic, technological, and economic developments. A rise in the population stimulated an increase in agricultural yields as land was cleared for arable use. Harvests were also helped by technical innovations such as iron horseshoes, the water mill, and the moldboard and wheeled plow. An increase in disposable income among the landowners encouraged trade and industry. As France entered the fourteenth century, then, the superiority of royal authority over noble might had been established and France was well on its way towards becoming a leading power in Europe. 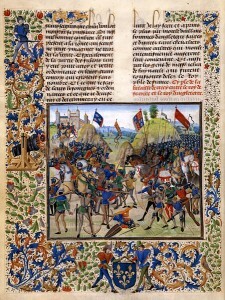 The achievements that had been made between 1000 and 1300 were threatened by the calamitous events of the fourteenth and early fifteenth centuries. In this period France experienced the terrors and depredations of famine (1309–11; 1315–17, after uncommonly cold weather and bad harvests), the Black Death (1347–48, with further visitations after this date) war, rebellion and unrest. 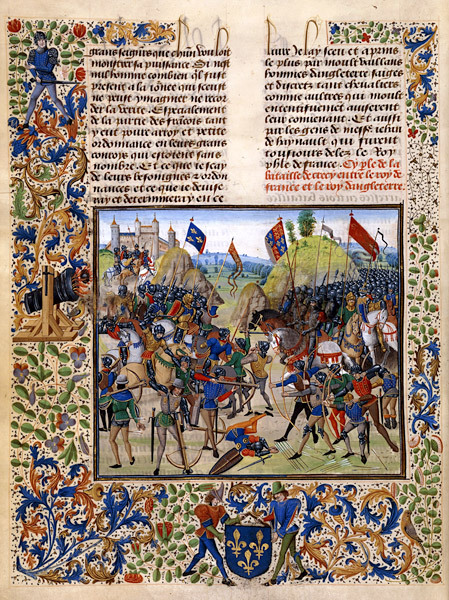 Dispute over the heir to the French throne led to a conflict with England that was fought—on and off—for over a hundred years (1337­–1453). War with England was nothing new; Capetian kings had spent much of the twelfth and thirteenth centuries attempting to take back territories in the hands of the English. When the three sons of Philip IV died in quick succession, Edward III claimed that he, as son of the daughter of Philip, was the rightful heir to the throne. 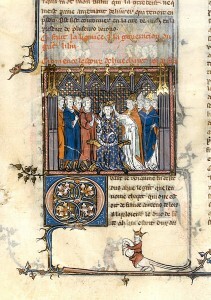 Instead, the throne was given to Philip’s nephew from the House of Valois (who became Philip VI). Though the big and bloody battles were few, the Hundred Years’ War was still extremely destructive and disruptive. The number of disorderly and undisciplined soldiers (often mercenaries) at large in the country took its toll: peasants were terrorized, crops and animals (and therefore livelihoods) destroyed. In such hard times, the people resented the increasing tax demands made by the king and sometimes expressed their anger in open revolt as in the series of peasant uprisings that occurred in 1358 known as the Jacquerie. —The Chronicle of Jean Froissart c.1380. Though it took some time, France did recover from these ordeals and continued its progress towards unity and centralization. Indeed, the country was able to glean some benefit from all the trials and tribulations. The significant decrease in population made labour a valuable resource and peasants enjoyed higher wages, a better standard of living, and a new level of freedom. This freedom led to increased social mobility that stimulated the growth of urban centres and of trade and industrialization. The monarchy also gained some advantage from the recent hardship. The long war had allowed for the creation of a permanent professional army and a system of regular taxation, and had given rise to a sense of national unity. Years of devastation and instability made the people hungry for order and good government on a scale the king could claim to provide. The need to reconstruct what had been destroyed gave the monarchy an opportunity to build the machinery of government along new and more autocratic lines; the kings of this period consolidated power and created an état royal free from the constraints of feudalism. This sense of nation building continued into the fifteenth and sixteenth centuries. Physically, the realm expanded as the princely states of Burgundy and Brittany were annexed. Government became increasingly focused on the strong personality of the monarch and a tight inner council responsible for ensuring the king’s will became law. With a sincere love of the arts and a willingness to spend money, Francis I (1494–1547) created chateaux, a library, and art collection worthy of a king. Francis was also responsible for the Ordinance of Villers-Cotterêts (1539) designed to legislate the use of French (as opposed to Latin) in official documents thereby ensuring one language united the country. Feeling themselves more secure at home, French kings turned their attention to foreign conquest and external enemies. In the early years of the sixteenth century, France sought to make conquests among the Italian states and, as the century wore on, fought against the Hapsburg Emperor, Charles V. These conflicts had the effect of uniting France against an external enemy while also channeling the martial energies of lords and princes away from internal squabbles and ambitions. While politically and militarily Italy was considered an enemy to be conquered, its culture was having a profound influence in France as well as in the rest of Europe. Italy was the birthplace of humanism, the intellectual movement that promoted new methods and goals of learning and a distinct vision of citizenship and identity grounded in ancient Greek and Latin texts, many of which had only recently been rediscovered. Humanism spread quickly throughout Europe largely as a result of the printing press. Invented in about 1440 by Johannes Gutenberg of Mainz, Germany, the printing press revolutionized book production and book consumption as books were produced en masse and at lower cost. By the end of the fifteenth century, printing presses had been established in well over two hundred cities in twelve European countries and more than twenty million texts had been produced. The fact that works by humanists like Desiderius Erasmus were among the earliest “bestsellers” indicates how humanist thought infiltrated society and encouraged a new way of seeing the world and humankind. The worth and dignity of humanity was asserted, as was its capacity for reason and perfectibility; a curiosity about the world, the things and the peoples in it, and even what may lie beyond it was fostered, and a more questioning attitude to religion emerged. In France, as elsewhere, humanists were both intellectuals and courtiers, serving the king in a variety of capacities or receiving royal patronage. Among the more famous French humanists are Guillaume Budé (1467–1540), the preeminent scholar of Greek literature who managed the royal library, and the writer François Rabelais. Leonardo da Vinci—whose name is now a byword for humanism and the spirit of the Renaissance—was brought to France by Francis I and spent his last years there. The questioning attitude fostered by humanism, along with the value given to the individual as opposed to the institution, helped pave the way for the religious reformation instigated by Martin Luther in the second decade of the sixteenth century. Luther’s manifesto was translated into French in 1520 but it was the writings of the French-born Calvin that seemed to galvanize the French people. Dealing with the bitter divide between the established Catholic church and Protestant reformers was a challenge for the French monarchy. French kings from Hugh Capet on had maintained a sense of the spiritual as well as secular dimension of royal authority. Possessing the title (granted by the pope) “most Christian king,” successive French monarchs had taken part in Crusades, embraced the model of Christian knighthood promulgated by the church, and attempted to tread a fine line between keeping up a good relationship with the institution that influenced, so fundamentally, every subject’s life while also asserting France’s right to self-determination. Francis I seemed to have preferred a more tolerant attitude towards French Protestants (soon to be known as Huguenots), perhaps as a result of his humanist leanings or his need for the support of the Protestant princes of Germany against the Hapsburg Empire. However, he was forced to take action after copies of an anti-Catholic manifesto appeared in Paris and the provinces in 1534. A “burning chamber” for the trials of heretics was established within the Parlement of Paris. As time went on the religious divide became more politicized as an increasing number of nobles converted to the new religion; Protestantism, it seems, became a way to protest against not only the established church but also the increasing power of the king. The second half of the sixteenth century would be marked by brutal and bloody civil war between Catholics and Huguenots that would test to the limit the strength and cohesion of the état royal established by monarchical power over the previous century. During a decade in which France was busy with its wars in Italy, Christopher Columbus made his discovery of the Americas and John Cabot took his journey to the “newe founde lande” that we now know as Canada. For reasons discussed below, France did not initially share the interest of other European states in Atlantic exploration and was slow to get involved (at least officially). 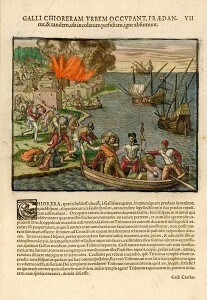 There was no question, though, of France remaining immune to the significance of the voyages made by Columbus (on behalf of the Spanish) and Cabot (on behalf of the English) for the exploration of the new lands and interaction with their peoples had social, economic, and political consequences for the whole of Europe. From the perspective of history, it has been common to view the year 1492 as a watershed moment: the moment when the European world “discovered” a whole “new world,” as if the idea that land existed beyond the western horizon was a surprise. In fact, for at least five centuries before Columbus’ voyage, Europeans had been exploring the far north-westerly reaches of the Atlantic and had lived—if only for a short time—in eastern Canada. 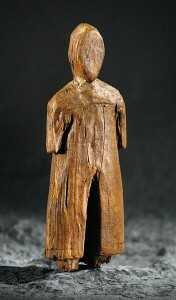 There is speculation that the first Europeans to set foot on the American continent were Irish monks. Driven by a desire to find places far from human society where they could live out their hermit lifestyle, the monks of Ireland were seafarers, settling in places like the Faroe Islands and Iceland. The sixth century monk St Brendan who set out on a seven year voyage in 565 AD had a slightly different motivation: he sought the paradisal and elusive “Land of Promise of the Saints.” The colourful account of Brendan’s voyage (the Navigatio Sancti Brendani Abbatis) contains descriptions of places that some have identified as in the vicinity of Greenland and even the American continent. As the account was written three centuries after Brendan’s journey it most likely incorporates knowledge and information accumulated by these sailor-monks through that time. that the site served as a transhipment station or gateway. A gateway is a community at the edge of a hinterland serving as the collection point and transshipment station for goods from various parts of this hinterland back to the core area. —“L’Anse aux Meadows and Vinland,” p. 228. The presence of butternuts—not grown in Newfoundland—indicates that the hinterland in this case may have stretched as far south as New Brunswick. According to Eirik’s Saga, the Norse abandoned their settlements because of the hostility of the native peoples by whom they were vastly outnumbered. It is also likely that the returns from the land were simply not worth the time and labour required to secure them. It is important to note that even though no more attempts were made to settle in Vinland, contact with the region continued for the next four centuries: evidence suggests that the Norse occupants of Greenland continued to journey to Labrador for lumber and may even have traded with the native people there. A Norse settlement existed on Greenland until the fifteenth century. 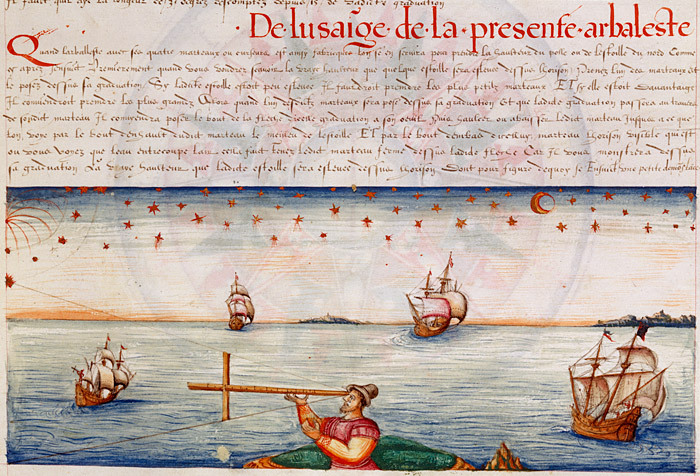 This history of exploration was only vaguely known to the majority of men and women of late medieval Europe. In part, this was because attention had for some time been focused elsewhere. For a combination of religious, military, and economic reasons, from the late eleventh century to the fourteenth century European interest was directed towards the East. The East was the direction of Jerusalem and the Holy Land, a destination for Christian pilgrims since the fourth century but also the site of repeated conflict between European Crusader knights and Muslims as the former sought to regain the Holy Land. Through the Crusades, Europeans gained knowledge of the lands and geography of the Middle East as well as an appetite for the goods produced in those lands; this appetite stimulated trade. Meanwhile Europeans became better acquainted with the lands of the Far East, previously conceived of in only vague and mysterious terms. The Mongol Empire which, at its height, encompassed most of Asia, was relatively friendly towards foreigners as evidenced in the life of the most famous European explorer before Columbus, Marco Polo. Trade especially took off and many trade routes across Asia were established. Merchants, missionaries, and diplomats became familiar with the lands, people, and customs of the East and, upon returning to Europe, wrote accounts of their travels. These narratives played an important role in moulding European perceptions of not only the countries and peoples of the East, but of themselves, and the world as a whole. Before the exploration of the East, views of its lands and people had been shaped by a medieval imagination nurtured on ideas drawn from biblical and classical sources combined with hearsay. There were rumours of tribes of men with the heads of dogs or only one giant foot instead of two. Such rumours were only partially tempered by the written accounts of travellers, accounts that still seemed to enjoy mixing factual details with fantastical fictions. This same mixture of real experience and a long-standing tradition of fabulous and apocryphal tales is also apparent in late medieval perceptions of the Atlantic. To some extent the journeys across the sea by Irish monks and the Vikings had become the stuff of myth and legend as these stories circulated with many others about the Western Sea and the islands believed to be within it. For most of Europe’s population, the Atlantic Ocean remained a place of mystery, and even terror. Stories and histories associated with the ocean went back to classical writers like Plato and Lucian who spoke of the lost city of Atlantis and the Fortunate Isles (later believed to be the Canaries). 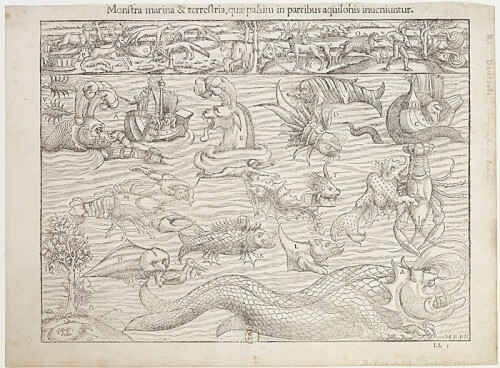 The Navigatio Sancti Brendani Abbatis, for all its possible connections to real places, still incorporates descriptions of monsters and the supernatural. 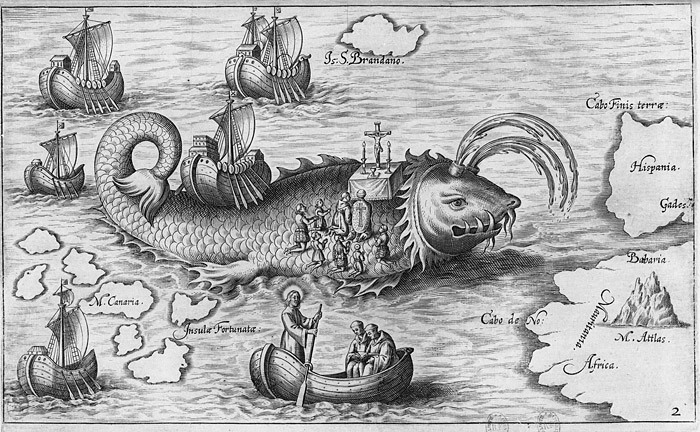 —From the account of the voyage of Saint Brendan, c. 900AD. Legends of lands believed to be across the sea (“islands” such as Brasil, Antillia, and St Brendan’s Isle) fired the medieval imagination and sparked many of the sea voyages of the late fourteenth and fifteenth centuries, some of which led to the discovery of new islands (for example, the Portuguese discovery of Madeira and the Azores). The combination of, on the one hand, growing knowledge and experience of the ocean and, on the other, the still pervasive myths about the “Western Sea” is illustrated by maps of the time. For a man or woman of the twenty-first century, the word “map” denotes, first and foremost, a document that contains the geographical information we need to help us identify and locate a place. For much of the Middle Ages, a map was essentially a symbolic document; conveying accurate information about distance and direction (by which, for example, a route could be charted) had not been the main goal of map-making. Traditionally, medieval maps of the world (mappae mundi) reflected Europe’s Christian worldview. Encyclopedic in scale and incorporating words and pictures, they conveyed ideas and knowledge relating to history, geography, theology, philosophy, and even zoology and their vision of the world was based on biblical and classical sources. 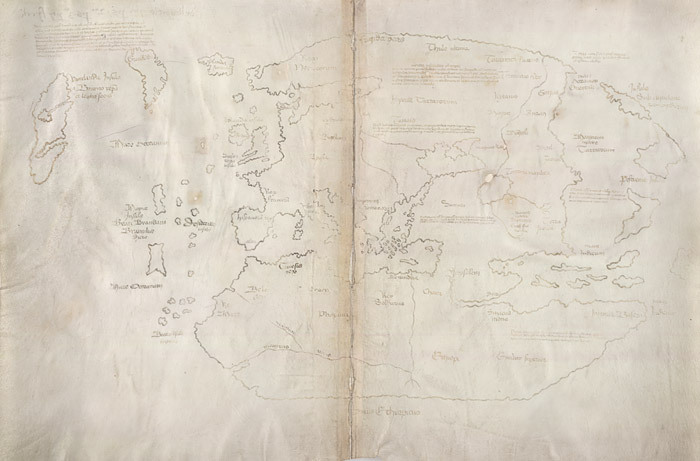 By the thirteenth century, some travellers sought to create maps that would detail their actual, observed experiences of distances and geography; nautical charts that date from circa 1300 reflect this impulse. More often than not, however, presentation of this practical information did not replace story, belief, and tradition but rather took a place alongside these perennial features of the map. 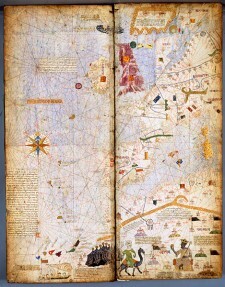 A good example is the Catalan Atlas, a map produced in Majorca in the 1370s but given as a gift to the French king Charles V. The map includes the pictures, biblical sites, and vision of history typical of the mappaemundi; it locates the mythical kingdom of Prester John and (twice) the island of Brasil. 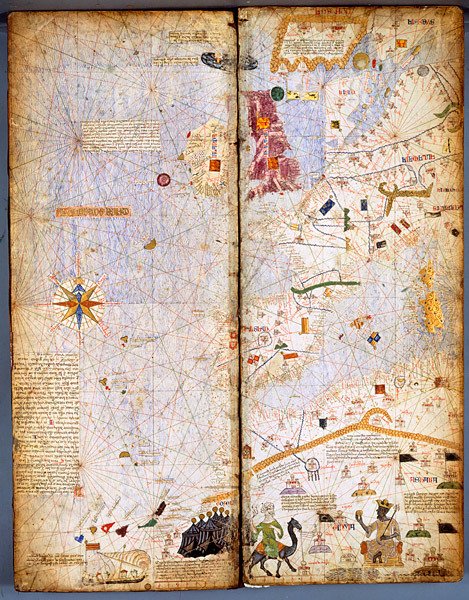 It also, however, depicts the trade routes in Africa used by Catalan merchants, draws precisely the coasts of the Mediterranean, Atlantic, and Black Sea, and provides the rhumb lines necessary for navigation. Cultural, economic, and technological developments of the late Middle Ages meant that a new degree of exploration had become desirable and possible by the fifteenth century. Eyes began to turn westward and more and more people ventured out on the mysterious ocean. By the late Middle Ages many merchants were feeling a pressing need for new trade routes with the East. During the thirteenth and fourteenth centuries the Mongol Empire had provided a stable environment in which trade along the Silk Road could flourish. Demand for goods from the East was increasing all the time but costs were high, largely as a result of the number of middlemen involved in the movement of goods across the great expanse of land between China and Europe. With the collapse of the Mongol Empire, trade became more difficult, dangerous, and even more expensive. The situation became harder still with the fall of Constantinople—an important node in trade networks—to the Ottoman Turks in 1453. 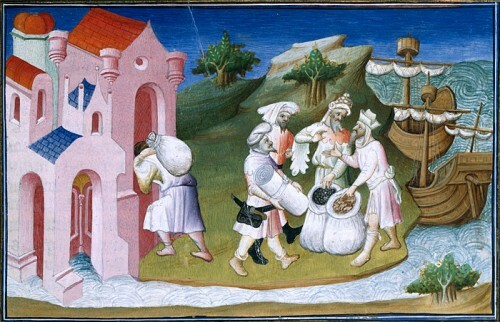 Some Muslims refused to deal with European merchants while others charged hefty taxes. The thought of the profits to be made by more direct trading stimulated the quest for a sea route to China (preferably one shorter than the route around Africa opened up by the Portuguese), shifting European focus from the lands to the east to the sea in the west. The goal (Cathay) had not changed: the west was of interest insofar as it offered a route to the East; Christopher Columbus and John Cabot headed west across the sea because they were in search of a route to the Orient. Meanwhile, technological advancements in shipping and in navigation made long-distance travel across the sea possible. The Portuguese developed the caravel, an Atlantic fishing boat, into a vessel capable of making exploratory voyages down the African coast. 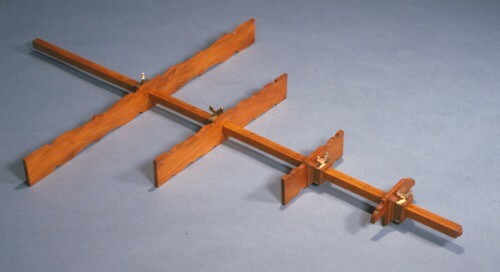 With two or three masts with lateen (triangular) sails, these ships were fast and maneuverable and capable of “proceeding” in either cross or head winds and therefore of sailing a chosen line and not wandering off course. They were favoured for exploratory voyages but had limited cargo-carrying capacity. The carrack, a three or four-masted ship with a mixture of square and lateen sails was deep-bellied with two or three decks. It could carry cargoes of a thousand tons but remained small enough to be financed privately. Many of the expeditions across the Atlantic during the fourteenth and first half of the fifteenth century involved caravels and carracks sailing together. Improvements to cartography and the compass, and the use of quadrants (used to measure the angle of the sun at midday to determine latitude) made navigation far more accurate. The broadside cannon had also been developed and could be used on ships as a defence system. Just as in France, throughout Europe the economy was in transition in the century after the Black Death. Though urban centres had seen the highest death rates, their recovery was aided by the arrival of migrants from the countryside—rural workers who took advantage of the labour shortage to cut feudal ties with manorial lords and move to towns. The “inheritance effect” meant that more wealth was concentrated in fewer hands leading to an increase in disposable income. The demand for luxury products, therefore, quickly rebounded after the immediate depression caused by the plague, a situation that merchants could exploit. Experienced merchants with good business acumen found ways to circumvent the high cost of labour and increase efficiency and therefore profit from the expanding market for fine goods. The merchant class grew in number and power. Through the creation of merchant companies or federations of merchants, a new middle class was becoming an increasingly powerful and self-directed force. Aided by the technological developments in shipping, international trade expanded and became a more streamlined system with new accounting practices, new legislation to govern international commercial practices, and an increased use of marine insurance policies. These developments helped merchants to not only acquire greater profits but also to organize these profits better so as to be able to invest in the sea voyages they hoped would make them even wealthier. Merchants were often the primary or sole backers of explorers with governments playing a lesser role. This partnership between monarchs and merchants would become all the more significant as the exploration of the new world gained pace in the sixteenth century. Notably members of this emerging middle class were shaped by new trends of thought. The trends at work in late medieval and early modern France (discussed above)—the growing prestige of the vernacular, increasing access to books, the rise in literacy, the cultivation of the arts, the emergence of humanism—were in evidence in other European nations. Knowledge that at one time may only have been shared among rich elites, the clergy, or university scholars, could now be disseminated among common people. Books were among the “luxury” items bought by members of the middle classes. Religious texts, including the Bible, were being translated into vernacular languages, as were works on history, science, and geography. The new knowledge was channeled into a curiosity about the world, humankind’s place within it, and a desire to discover and explore more of it. The role of the Portuguese as shipbuilders has been mentioned already. 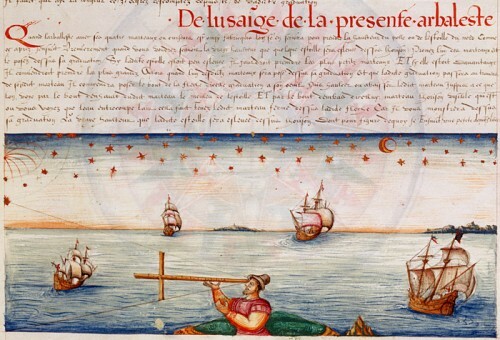 Ambitious explorers, from the mid-1400s the Portuguese were persistently exploring the coast of Africa, anxious to circumnavigate the continent and find a route to Asia. The Portuguese also led the search for Atlantic islands, discovering and settling Madeira, the Azores, and the Cape Verde islands. 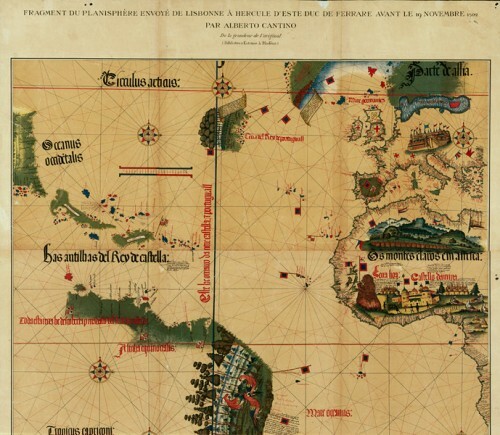 The Azores are nearly halfway between Portugal and Newfoundland and were used as a base for ventures further north and west in the early 1500s. These ventures included a journey to Greenland made by an Azorean landowner (or lavrador) Joao Fernandes who later directed English sailors to Greenland and possibly beyond to the area so recently discovered by Cabot. The “land of the Labrador” became a term used to describe various parts of the “newe founde lande” explored by the Portuguese—from the Strait of Belle Isle to Nova Scotia. By 1521 the Portuguese had also established a colony on the eastern coast of Cape Breton Island, the first European colony in North America since its “re-discovery.” The settlement was given up after only a few years. When the Italian explorer Christopher Columbus sought the backing of Portugal for his project to find an alternative route to Asia across the western sea, his proposal was rejected. A few years later he secured the patronage of King Ferdinand and Queen Isabella of Spain. The results of the 1492 voyage (taken by a carrack and two caravels), and the three that followed, are well known and, because of the significance of Columbus’ discovery in initiating the lasting contact between Europe and the Americas that has helped shape the modern world, Columbus is often viewed as a “Renaissance Man” somehow distinguished from the late medieval and early modern context we have been describing here. In fact, Columbus was very much a man of his times. As a member of the emerging middle class, Columbus’s life reflects the new social mobility that became possible in the late Middle Ages. He was from a family of weavers who migrated from the countryside to the city of Genoa and established a successful business there. Genoa was an important centre of trade and his family’s connections with merchant suppliers may have helped Columbus find work on ships. Like others, Columbus benefited from increasing access to books and read widely in a variety of subjects. At the same time, however, he remained a devout believer in the institutions and structures that had supported the medieval world. Columbus viewed his life and activities through the lens of his Catholic religion and supported the militant form of Christianity expressed in the Crusades (he originally suggested that all profits from his enterprise be used to fund the re-conquest of Jerusalem). He saw his discoveries as part of the process of Christianizing the world, a process he believed would hasten the second coming of Jesus Christ, and wrote at length on this subject in his El Libro de las Profecías or Book of Prophecies. Columbus’ knowledge of the world was the mixture of real, informed knowledge and legend and tradition that was typical of the time. Columbus owned a copy of Marco Polo’s Travels and his annotations show that he read it carefully and probably gleaned his knowledge of Asia from its pages; he gathered information from recent discoveries by the Portuguese and apparently learnt from inhabitants of the Azores of the likely existence of land to the west. He based his voyages on calculations of the world’s size by cosmographers like the Italian Paolo dal Pozzo Toscanelli and the French Pierre d’Ailly and consequently reduced the size of the globe by a third. Columbus believed in the existence of the legendary island of Antillia and considered it a good stop-off point on the western route to Asia. Most notably, Columbus held stubbornly until his death the belief that the land he had discovered across the ocean was not a “new” world but part of the Asian continent, the “old” world. In the first decade of the fifteenth century English fishermen (many from the Atlantic port of Bristol) began travelling to Icelandic waters to take advantage of the rich supplies of cod to be found there. Such a journey—far longer and more ambitious than any previously made by Englishmen—had become possible because of the advances in shipbuilding and navigation. As well as offering an abundance of cod, Iceland proved to be a profitable market for English goods and trade relations were established. English-Icelandic interactions (by 1484, forty-eight Icelanders were living in Bristol) may have helped disseminate information about Greenland and other lands even farther west of which vague knowledge still lingered in Iceland’s collective memory. When, in the last quarter of the fifteenth century, the English were finally forced out of Icelandic waters by the Danes who ruled Iceland, some of the pluckier fishermen—according to contemporary documents—headed west in search of the “Isle of Brasile.” As the use of the somewhat generic term for the sought-after but elusive islands of the Atlantic suggests, there was a certain spirit of adventure at work here, but there was also a need to find new cod fishing waters, even new markets for English goods. It seems likely that these fishermen headed west with an expectation of finding land because of the stories or rumours they had heard in Iceland. This interpretation implies a continuity of European knowledge about eastern Canada, from Norse times to the Renaissance. We know that the Greenlandic Norse were visiting eastern Canada at least as recently as 1347 . . . Bristol fishermen may have been making use of the area as early as 1480 . . . The remarkable voyage of John Cabot may, therefore, not have been a voyage of discovery, but merely another event in a continuous series of European visits to the region over the previous 500 years. —Robert McGhee. Canada Rediscovered. Canadian Museum of Civilization, 1991. p. 92. France joined the exploration game relatively late in the day, at least in an official capacity. Because France’s position on the Mediterranean allowed it to benefit from the trade routes to the Orient that crossed North Africa and the Near East it did not have the same degree of mercantile interest and investment in Atlantic exploration as existed in other countries. There were, nevertheless, explorers in the country’s midst: in 1402, two Frenchmen, Gadifer de la Salle and Jean de Bethencourt explored the Canaries and established a European presence there. They worked, however, on behalf of Castile, not France. In the late 1480s, while Christopher Columbus was seeking the support of the Spanish crown for his venture, his brother Bartholomew was in France seeking the backing of Charles VIII. Though the king treated Bartholomew well he chose not to patronize the project. 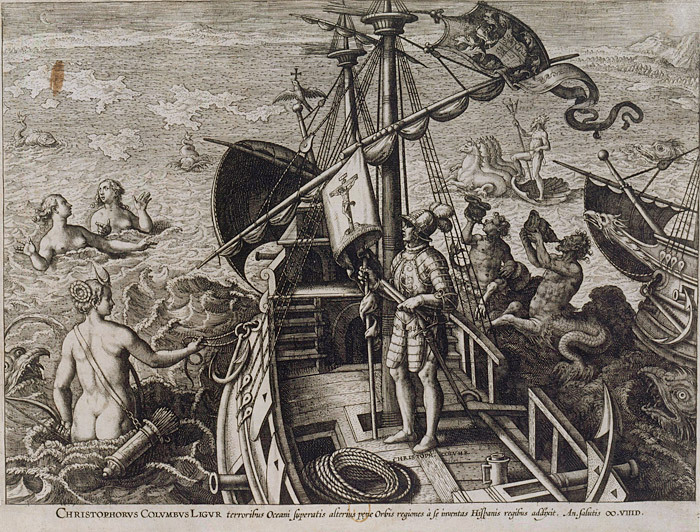 By the early years of the sixteenth century French adventurers were setting out on the Atlantic seeking to benefit commercially from the New World. In 1503 a sailor from Normandy, Binot Paulmier de Gonneville set sail and returned in 1505 claiming to have found a land south east of Africa. It is likely, in fact, that he travelled to the coast of Brazil. In 1506 a fisherman from Honfleur, Jean Denys, sailed to Newfoundland to take advantage of the cod; he would be the first of many. Indeed, the fishermen of Normandy, Brittany and the Basque region wasted little time in joining the English and Portuguese in the rich codbanks around Newfoundland. According to one contemporary report, by 1519 over 100 French ships were making annual voyages to Newfoundland and France rapidly became a significant force in the Newfoundland fishery. Nor did these fishermen stick to charted waters. The degree of competition with the fishermen of England and Portugal was an incentive to explore new areas. When Cartier—an “official” explorer—entered the Strait of Belle Isle and the northern Gulf of St Lawrence he found French fishermen already installed there; indeed, a number of harbours were already named after French fishermen. Le soleil luit pour moi comme pour les autres. Je voudrais bien voir la clause d’Adam qui m’exclut du partage du monde. It was perhaps this attitude that led Francis (in common with other European monarchs) to back privateers (or corsairs) who raided Spanish ships, loaded with rich cargo, as they travelled between the Caribbean and Spain. These corsairs were basically authorized pirates but, given that France was so often at war with Spain during the first half of the sixteenth century, the looting was viewed as a legitimate battle tactic. 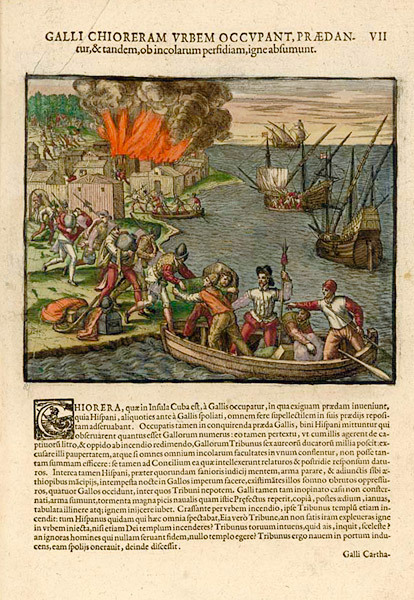 In one of the first acts of piracy against Spain and its newfound gold supply, the corsair Jean Fleury seized four Spanish ships as they passed near the Azores and claimed their treasure (which included riches from the recent conquest of Mexico) for Francis I. The extent of the profits to be made from these raids encouraged other privateers to travel further afield, even to the Caribbean itself, in order to attack not just ships but coastal settlements. By the middle of the century as many as thirty French raiding ships made the journey to the Caribbean every year; the number indicates not only how much profit these French sailors were making but also how familiar they were becoming with the ocean and its shipping routes. Supporting piracy was a less expensive way of undermining the Spanish economy and Spain’s dominion of the high seas than trying to seize land. There remained, however, more of the Atlantic, and the new lands, to explore. Showing an interest in establishing France’s stake in the new world, Francis I commissioned the Italian navigator Giovanni da Verrazzano with the task of finding a passage through the newly discovered land that would open up the elusive and much-desired westward sailing route to Asia. Verrazzano travelled a great stretch of the American coast (from Cape Fear on the North Carolina coast to Newfoundland) thereby establishing the vast length of the continent and the extent of the obstacle it posed to reaching Asia. He named the land New France but returned to Francis I only to discover that the king’s interest in exploration had waned as he was once again taken up with wars in Europe. A further ten years passed before Francis I gave his backing to another attempt to find a passage through the continent; it is possible that rumours being circulated about the great “gulf” behind Newfoundland being explored by French fishermen made him more confident about the possibility of success. —Girolamo Cardano, Milanese physician, 1576. (qtd. in Phillips and Phillips, The Worlds of Christopher Columbus). BRAUDEL, FERNAND, Le Monde de Jacques Cartier: L’Aventure au XVI Siècle. Paris: Berger-Levrault, Montreal: Libre-Expression 1984. CAMPBELL, MARY BAINE. 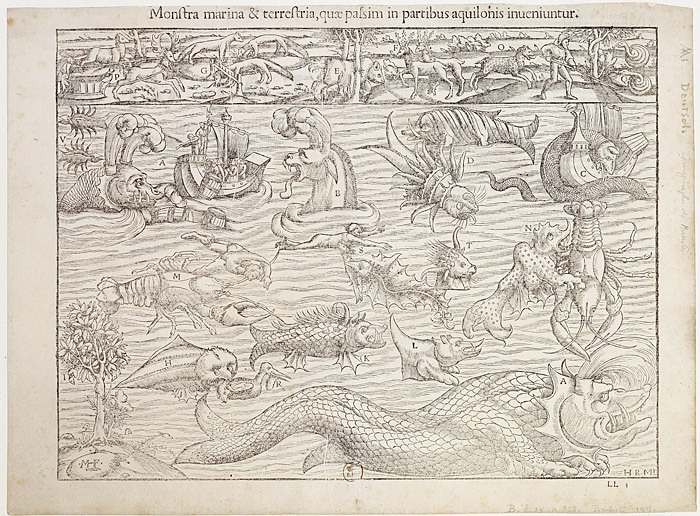 The Witness and the Other World: Exotic European Travel Writing, 400–1600. Cornell: Cornell University Press, 1991. COLUMBUS, CHRISTOPHER, The Four Voyages. ed. J. M Cohen. London: Penguin Classics, 1992. 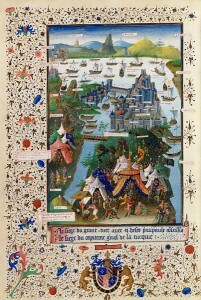 DE BERTIER DE SAUVIGNY, G. and DAVID H. PINKEY, History of France. Revised and Expanded ed. Arlington Heights, IL: The Forum Press, 1983. EDSON, EVELYN, The World Map, 1300–1492. Baltimore: The John Hopkins University Press, 2007. FROISSART, JEAN. Chronicles. Ed. and trans. Geoffrey Brereton. London: Penguin Classics, 1978. HALLAM, ELIZABETH M. AND JUDITH EVERARD, Capetian France 987-1328. 2ND ed. London: Longman, 2001. KOMROFF, MANUEL, ed. The Travels of Marco Polo (trans. by William Marsden). London: Everyman’s Library, 2008. KNECHT, R. J., Francis I. Cambridge, Cambridge University Press, 1984. JONES, COLIN, The Cambridge Illustrated History of France. Cambridge: Cambridge University Press, 1994. McGHEE, ROBERT, Canada Rediscovered. Ottawa: Museum of Civilization, 1991. McGHEE, ROBERT, “Epilogue: Was There Continuity from Norse to Post-Medieval Explorations of the New World?” in James H. Barrett ed. Contact, Continuity, Collapse: The Norse Colonization of the North Atlantic. Turnhout: Brepols, 2003. 239–248. O’MEARA, JOHN, trans. The Voyage of Saint Brendan. Dublin: Dolmen Press, 1981. PHILLIPS, WILLIAM D, JR and CARLA RAHN PHILLIPS, The Worlds of Christopher Columbus. Cambridge: Cambridge University Press, 1992. PRICE, ROGER, A Concise History of France. 2nd ed. Cambridge: Cambridge University Press, 2005. SHARP, J. J., Discovery in the North Atlantic: from the 6th to the 17th Century. Halifax: Nimbus, 1991. THORSSON, ORNOLFUR, The Sagas of the Icelanders: A Selection. New York: Viking, 2000. WALLACE, BIRGITTA LINDEROTH, “L’Anse aux Meadows and Vinland: An Abandoned Experiment” in James H. Barrett ed. Contact, Continuity, Collapse: The Norse Colonization of the North Atlantic. Turnhout: Brepols, 2003. 207–238.